Welcome to the participating vanpools page. Here you will find all the information, forms, and resources you will need to keep your Metro Vanpool rolling. Volunteer Participants are the primary drivers or leaseholders who are under agreement with Metro to operate Metro Vanpool Program vehicles. We value your involvement as a Volunteer Participant and realize that without you, your vanpool might not be on the road. Below you’ll find a Table of Contents that highlights all the sections and subsections. Click on any of the links to jump to that information. Or, you can simply scroll down. Be sure to also check out our Frequently Asked Questions page. There you will find answers to the most commonly asked questions. Please contact the Help Desk if you have any questions about your vanpool, 213.922.7003 or vanpool@metro.net . Thank you for your commitment to the Metro Vanpool Program. Every month, all enrolled vanpools are required to submit a Monthly Vanpool Report. See the instructions and sample below to help you submit a complete and valid Monthly Vanpool Report. Below you will also find two types of the latest Monthly Vanpool Report. The Writable PDF is suitable for completing on your computer. The Print PDF is designed to be printed and completed by hand. Whichever type of the Monthly Vanpool Report you choose, please use only the latest version of the Monthly Vanpool Report found below. Don’t forget, Metro requires handwritten signatures. Also, we provide a handy calendar showing the due dates for your Monthly Vanpool Reports. How can you tell if your Monthly Vanpool Report is the latest version? See the graphic below. Look for the large black box in the lower right corner and the vertical 2016 or 2018 copyright in small print on the far right side of the report. Anytime there are changes to your Vanpool you will need to complete a Vanpool Update form. See the instructions and sample below for details about how to process your change. If you would like to know what we currently have on file, send an email with your name and Vehicle Number and we will send you a copy of your passenger list. 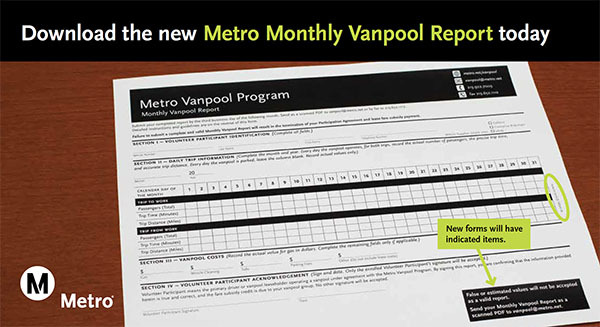 Even if you have notified your employer or vehicle supplier about the change to your vanpool, you will need to notify Metro using a Vanpool Update form. If you are having trouble finding a street address for your locations, try the Metro Vanpool Program Pick-Up Location Finder below. Every month, Metro randomly selects 30 vanpools to record detailed passenger and trip information on a particular day. These audits are randomly selected. So, Volunteer Participants may get multiple audits in a short period of time. Our audit procedure is required to satisfy Federal reporting requirements and therefore Metro cannot change your audit date. If your vanpool will not operate on that day you are required to write the reason for non-operation anywhere on the form and return it. Please review the instructions and sample audit below and visit our Frequently Asked Questions page for more information. In this section we highlight the Policies and Procedures that govern the Metro Vanpool Program. Also, be sure to check out our Frequently Asked Questions page. There you will find answers to the most commonly asked questions. If you apply to participate in the Metro Vanpool Program and your application is accepted you become a Volunteer Participant. So long as you continue to meet the terms of our Agreement and follow our Guidelines, your enrollment will continue. Metro values the hard work and dedication of all our Volunteer Participants. 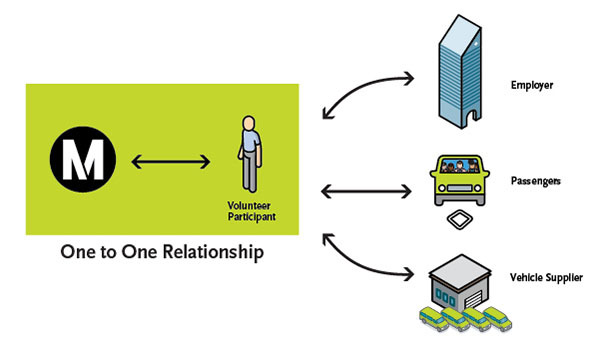 The nature of the relationship between Metro and the enrolled Volunteer Participant is one to one. In other words, the Volunteer Participant is solely responsible for maintaining his or her vanpool and is the primary point of contact Metro will have with that vanpool. The green box highlights the one to one relationship between an enrolled Volunteer Participant and Metro. The Metro Vanpool Program is publicly funded, voluntary, and designed to support individuals in their efforts for greener commutes. No one is required to participate. If you are unable to enter into a one to one relationship, please let us know. We can provide you with other ridesharing options for you to consider. We recognize that a Volunteer Participant will also have responsibilities to passengers, their employer, and their vehicle supplier. Well-meaning passengers and employer representatives may reach out to Metro on behalf of a Volunteer Participant. But, Metro can only communicate with the enrolled Volunteer Participant. If you have questions about the one to one relationship between Metro and an enrolled Volunteer Participant, contact the Help Desk 213.922.7003 or vanpool@metro.net . We will be happy to help.